Let&apos;s talk about ube. 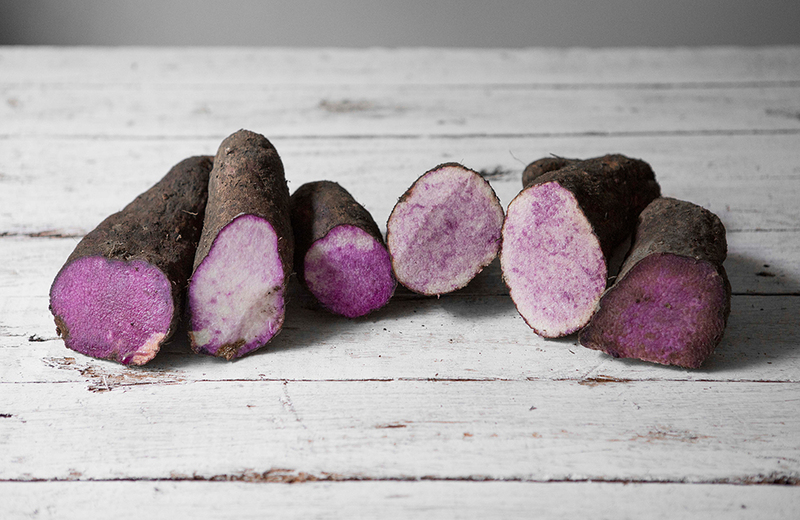 The purple yam, which is pronounced (oo-beh), has been lazily dubbed as just another hipster trend or Instagram darling that you will soon be sick of — but those headlines are wrong. Sure, the root vegetable, which has a sublime deep purple color, makes for a highly photogenic donut and ice cream base, but it&apos;s also a staple of Filipino cuisine that deserves a bit more respect and understanding. "Ube is not an exotic ingredient in the Philippines, but a common everyday ingredient," Nicole Ponseca, the owner of two renowned Filipino restaurants in New York City, Maharlika and Jeepney, said in an interview. It&apos;s essentially the Philippines&apos; equivalent of a sweet potato, she added. "But ours just have a saturated, technicolor, Prince-worthy shade of purple." Ponseca, who grew up in San Diego, California, recounts going to her mother&apos;s work pot luck, where they brought an ube dessert. "People would make fun of ube and be like, &apos;Ew what&apos;s that?&apos;" she said. "I remember being chastised about it." So Ponseca finds it a bit irksome that ube is suddenly being embraced by people who might have thought it was gross before they received all those Instagram likes. Still, Ponseca is glad that ube is finally becoming welcomed in the U.S. "There are going to be people who appropriate it and bastardize it, but I&apos;d rather not keep ube in the closet," Ponseca explained. It&apos;s too good to not be loved. So what does ube even taste like? While ube is technically a tuber, just like a potato, its flavor is less savory. Ponseca describes the taste of the purple yam as an amalgamation of vanilla with the nuttiness of pistachio. But the flavor is quite gentle and not too intense. Because of its somewhat sweet flavor profile, ube is most commonly used in sweet dishes over savory ones. The vegetable is used to make everything from cakes, to cheesecakes, to flans, to candy and ice cream. It&apos;s also a staple ingredients in halo-halo (pictured above), a popular Filipino treat of shaved ice, evaporated milk and a number of toppings like ube, tapioca and plantains. In the U.S., ube is most often found on menus in ice cream form, though some restaurants do make vibrant purple baked goods from it. Ponseca likes to give ube the sweet-and-savory treatment at her restaurants, where she serves fried chicken with ube waffles. It&apos;s easy to confuse ube with taro, but they are completely different foods. Taro, which is also popular in Filipino cuisine, is typically white on the inside and not purple, though it may turn purple once cooked, Paste noted. Taro is also typically used in savory dishes in Filipino cooking, while ube is more commonly used for sweet treats. It&apos;s incredibly difficult to find fresh ube, Ponseca explained. "I&apos;ve only found it once in the U.S." Typically, ube is sold after the fresh tuber has been processed. Ponseca says that the purple yam can be found in three different forms. One is a dehydrated powder, which is made from an ube that is dried and then pulverized. Ube is also available as an extract. "It&apos;s basically like food coloring, except that it is made from ube and also has the ube flavor," Ponseca said. Ube jam or ube paste (also known as ube halaya) may be ube&apos;s most commonly sold form. This version is often sweetened, making it perfect for baked goods. Interested parties would be hard-pressed to not find some form of ube at a local Filipino store or on Amazon, Ponseca said, making it super easy to turn everything you eat into a purple feast. Ube is nutritionally similar to other starchy tubers like plain ole yams. One cup of ube contains about 158 calories, SF Gate noted. The vegetable has very little protein and fat, and it provides nearly 20% of a person&apos;s daily vitamin A and vitamin C needs, the newspaper added. While it&apos;s nutritional profile is pretty harmless on its own, ube is most often used in desserts, where its health benefits are overshadowed by added sugar and calories, so beware!